President Barack Obama's main domestic priority, healthcare reform, has cleared a key hurdle in the US Senate. 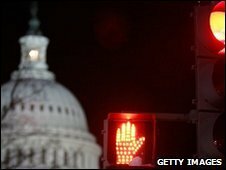 Senators voted 60 to 40 along party lines to end debate on a compromise bill, putting the legislation on course to face a final vote on Christmas Eve. The final Senate bill will then have to be reconciled with a more expansive one passed by the House of Representatives. The reform measure aims to extend health coverage to more than 30m people who currently lack health insurance. The long, often acrimonious, debate culminated in a procedural vote at 0100 (0600 GMT) on Monday, when the Democratic caucus voted unanimously to overcome delaying tactics by the Republicans. The Democrats had been confident after Democratic Senator Ben Nelson, who had been holding out for further changes, on Saturday agreed to a compromise and announced he would back the bill. Sixty votes are needed to bypass a lengthy debate, or filibuster. The Democrats control exactly 60, so every vote counts. "We'll get this passed before Christmas and it will be one of the best Christmas presents this Congress has ever given the American people," said Democratic Senator Tom Harkin. Republicans have argued that the legislation is flawed. "Mark my words, this legislation will reshape our nation. And Americans have already issued their verdict. They don't want it," said Senate minority leader Mitch McConnell. Three further votes are scheduled this week on the issue. President Obama has set health reform as a key plank of his first term and wants the Senate to pass the bill by the end of the year. The legislation - designed to secure coverage for millions of uninsured Americans - could lead to the biggest changes in US healthcare in decades, if approved. Under the Senate bill, most Americans would have to have health insurance, while private insurers would be banned from refusing to provide insurance because applicants had pre-existing medical conditions. Insurance would be made more affordable with subsidies available to help those in lower income bands, the Democrats say. People would also have access to new insurance market places. The Senate bill must be reconciled with the legislation passed by the House before President Obama can sign it into law. The House version still includes a government-run health insurance plan, or public option, that was removed from the Senate version. There are also differences over how to pay for the reform.